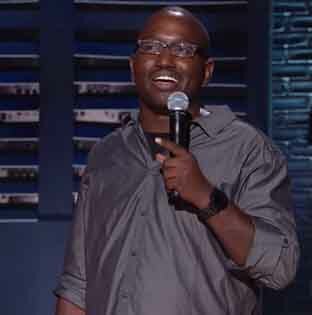 Buress performing stand-up for a Comedy Central special. - The A.V. Club draws our attention to complaints made against Hannibal Buress by Eastern Illinois University&apos;s school paper, spurred by sections from Burress&apos; stand-up routine. In the routines, Buress apparently discusses The Daily Eastern News&apos; disclosure of how much he was paid to perform at the University in a 2009 article, among other things: "During his act, Buress admits to telling our reporter that his performances include jokes related to &apos;personal stories, current events, the streets and even food&apos;," the opinion piece reads. "Buress then proceeded to mock The DEN for including this comment. However, the blame for such a portrayal lies explicitly on Buress. If he did not wish for us to include that he talks about &apos;the streets&apos; in his act, he should not have said it in his interview." - David Schwimmer will star in Detroit at Playwright Horizons in New York the summer, the Associated Press reports, opposite Amy Ryan. The play premiered at Steppenwolf in the fall of 2010. - Here are a few performances and appearances to look forward to at the Tony&apos;s.
- Redmoon will be performing at Wicker Park Fest, as part of the festival&apos;s expanded arts line-up. Chicagoist says they&apos;ll be doing, "a piece called The Sonic Boom, a massive battery powered vehicle, sculpture, and performance platform. Redmoon performers will activate the two hydraulic performance platforms and mobile DJ booth with spectacle performance and sound pieces, a portion of which will be fully composed in advance and a portion that will be structured for live improvisation during the event." No word on whether there will be fire, but they&apos;ll be there both July 28 and 29th, time TBD. - Clybourne Park has had a month added to its Broadway run; it now closes August 12.